CB650E – Heavy Duty Electric Comb Binding Machine. Suits Medium to Large Volume Binding Requirements. 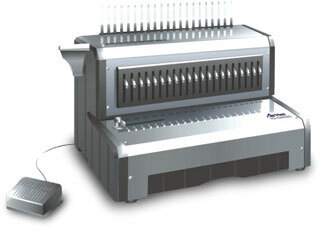 CB650E – Heavy Duty Electric Comb Binding Machine. All metal made mechanism-Solid steel construction. Punches up to 25 sheets of 80gsm paper. Binds up to 375 pages-All comb sizes 6mm-51mm. Margin Depth Adjuster (3-8mm from edge of the page). Removable Punching Dies-for smaller documents ie A5.